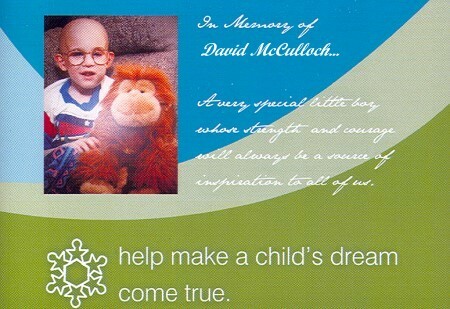 Westman Dreams for Kids began with the story of a young boy named David MuCulloch. In 1993 two business men heard of this little boy from Minnedosa, MB who needed financial help to travel outside of Manitoba to treat his Cancer. David was very ill and it was decided that a small gift, a stuffed monkey was to be given to him to put a smile on his face. When he was asked what his monkeys name was going to be he replied “King Louie” his favorite character from the Jungle Book. King Louie has become a very important staple for Westman Dreams for Kids being given to every child we help; a reminder of this brave little boy who helped create this organization to help children facing serious illness and disabilities in the Westman area. Since David, Westman Dreams for Kids has granted dreams to hundreds of children right here in Westman. We’ve had dreams that range from help with expenses, computer systems to help the kids who are unable to attend school to the ultimate dream, a trip to meet Mickey in Disney Land. To see the joy that these families feel is the most rewarding experience for everyone who is part of our Dreams family. Westman Dreams for Kids consists of a Board of Directors and all of our dreams are overseen by an Advisory Committee. These dedicated people are the driving force behind our organization and they play a very important role, supporting our families, bringing joy and friendship into their lives and giving them a little hope for the future. We have a network of volunteers to help us with all our events and support from the Westman area. All of these people have made us strong and given us the ability to continue to honor the bravery of David and the many children like him. It has been our privilege to meet these children in our community and hope to continue this mission for many years to come.